Vancouver, BC – The No. 9 ranked University of British Columbia women’s hockey team looks to end their regular season schedule at ‘the Doug’ with a pair of wins against the No. 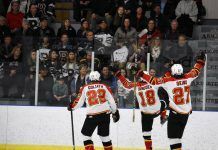 8 ranked University of Manitoba Bisons, who come to the west coast on an eight-game winning streak. The ‘Birds (15-5-4) currently sit third in the Canada West standings, a slim two points behind the second place Bisons (18-5-1). Both teams will be without their captains as UBC’s Sarah Casorso and Manitoba’s Maggie Litchfield-Medd compete in the FISU Winter Universiade. The past weekend proved successful for UBC as they completed a sweep against the visiting University of Lethbridge Pronghorns with a score of 5-1 in each matchup. Both games featured offensive firepower from point-producing regulars Tatiana Rafter, Nicole Saxvik, Rebecca Unrau, and a slew of other hungry T-Birds. With just four games left in the regular season schedule, the Thunderbirds already know they will host a home playoff series, it’s just a matter of when and against which opponent. They could finish anywhere from first to fourth in the conference. If they finish in the top two spots they will earn a first round bye, if they finish third or fourth they will host a Canada West quarter-final series. UBC looks to continue their offensive production into this weekend’s series against Manitoba. With an impressive 15-2-0 record, Dyck’s sits second in the division in wins and goals against average (1.28). Goal scoring prowess will be on full display this weekend as the second-most prolific scorer in the Canada West, Manitoba’s Alanna Sharman, meets UBC’s Rafter, who fourth in conference scoring. Sharman, in just her first season in the CIS, has taken the conference by storm, putting away 16 goals and 16 assists so far this year for a total of 32 points. Sharman will be looking for help from fellow Bisons scorer Alana Serhan (15G, 7A) and frequent helpers defencemen Lauryn Keen (5G, 11A) and Michelle Pawluk (2G, 10A). In two games fewer, Rafter has scored 11 goals and 13 assists for a total 24 points. UBC can also count on Saxvik (10G, 10A) and Unrau (11G, 8A) to help output. The other half of the equation falls on Thunderbird defence. Both Danielle Dube and Samantha Langford earned ‘Ws’ last weekend, each with a single goal against. Dube stopped 22 out of 23 shots faced, and Langford stopped 17 out of 18. Friday’s puck drop is slated for 7:00 pm at the Doug Mitchell Thunderbird Sports Centre, with a rematch the following day at 2:00 pm, in which UBC seniors Rafter and Nikola Brown-John will be recognized for their Thunderbird careers.